Safety and service onboard domestic and international flights out of Copenhagen. Helping start up one café in Fredriksberg 2004 and one in Amager in 2005. My studies have given me a good understanding of how cultural, economical relationships and political systems affects and shapes each other. Furthermore it has given me great knowledge about how to analyse human behaviour and describe events and their consequences. Purser on long-haul flights. Employed by SAS since 1987. Bilingual Swedish-Danish; proficient in English; conversational French. 2011 Part of a campaign team in Malmö area, for the biggest and yearly fundraising event in Sweden to raise money for different projects to ensure and strengthen children's rights around the world. 2011 Awareness building for a regional Amnesty group in Melbourne, Australia. 2008 Three months Field study and work with neglected/abused children in the Philippines at two NGOs. Work involved with the rehabilitation of these children. 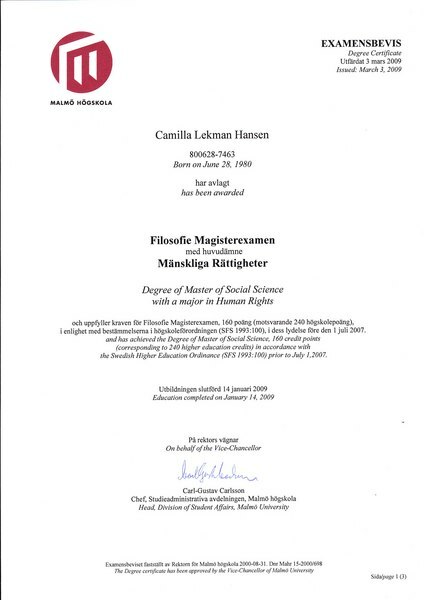 The primary purpose was to research material for my Master’s thesis about children’s rights. 1999-2001 The Union for the homeless, Sweden. Arranging Christmas parties at Wallmans for the homeless, helping run the homeless tent at Malmö festival and other smaller events. 1998 Applied and awarded the opportunity to help in Khartoum, Sudan through the Swedish church and Lutherhjälpen. Work was to ensure gathered money was sent to the right places, including women movements and building of schools. 1995-1999 Chairman in the Church for Youth in Malmö St Petri Church and a board member of the international committee in the south of Sweden. I am a very social and considerate individual with a huge interest in Global Justice and Human Rights. 32 year old, born in Denmark, raised in Sweden and lived longer periods in France and Australia. I am very friendly and someone easy to get along with especially in group. Whilst I enjoy working as part of a group I am also great at working independently. I am a considerate, loyal and helpful friend and colleague. My mission in life is to give more than I take. Work is an important part of me, and I always give my entire effort and find great satisfaction in finishing tasks. Human rights have become an essential part of my life both in my daily choices and in my personal vision. My passion is evidenced by my many years volunteering in the area of Human rights. Furthermore I have devoted my entire education and ultimately Master’s Thesis to the subject. My interest in Human Rights began many years back. Over 15 years ago in fact when I was 17, I applied for and was accepted (of 2 in total) to volunteer in Sudan. This work consolidated my passion for the area. The work involved managing a program designed to assist women and build schools in outskirts of Khartoum (an area especially difficult for women). My passion has grown from there, contributing more to volunteering and most recently working at 2 NGOs in the Philippines. This work was part of my Thesis examining the role of “re-introducing” play to the lives of abused children, thereby giving children back their childhood. During my studies I have worked part-time as an air hostess for Scandinavian airlines system in Copenhagen. Whilst I have enjoyed working with hospitality I am committed to pursue my passion for Human rights work.